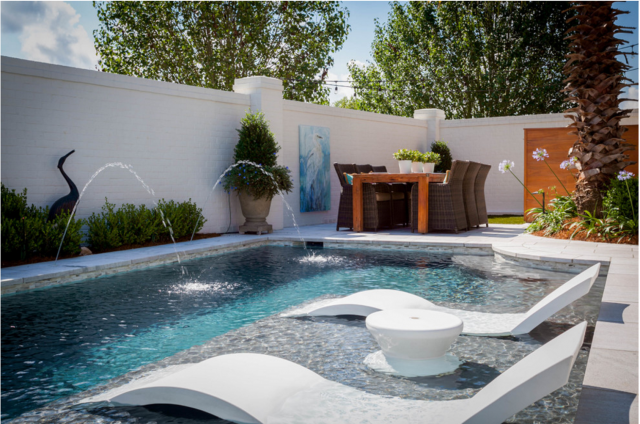 Want to cool off in your pool while relaxing in the comfort of a lounge chair? Check out the stylish, in-water Chaise lounges by Ledge Lounger. These innovative pool chairs are designed for placement on your pool’s tanning ledge or Baja shelf so you can kick back and enjoy the beauty of your pool and the refreshing feeling of the water. 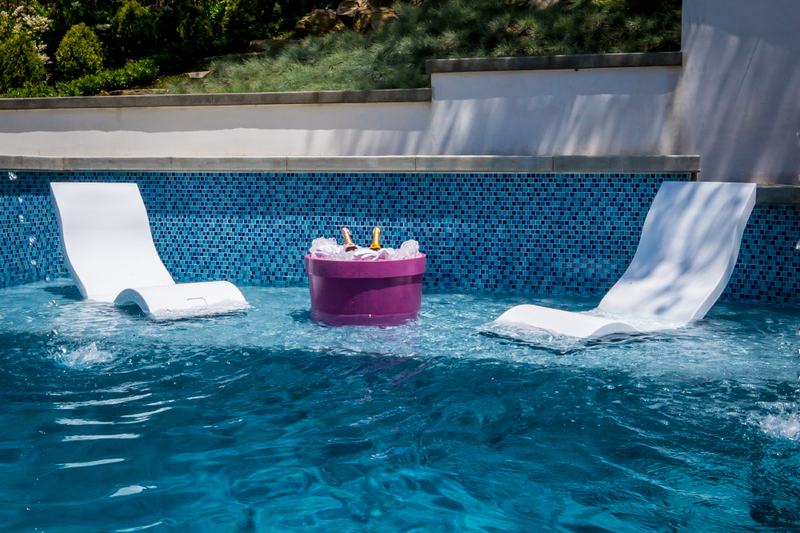 The Chaise lounges are easily installed by placing them on your pool’s tanning ledge and filling them with water. 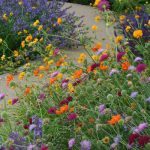 This keeps the furniture in place even when it’s not in use, meaning you can keep it in your pool for the entire pool season, or year-round if you live in a warm climate. Made of durable polyethylene, Ledge Lounger pool furniture is resistant to harsh chemicals, saltwater, UV rays, and weathering. It’s safe for all pools, including vinyl-lined pools. The chaise lounges are available in 11 different colors—including white, blue, sandstone, and granite gray–and require very little maintenance to keep clean. The Chaise lounge comes in two sizes: one for 0 – 9 inches of water, and a deeper lounge for 10 – 15 inches of water, so you can select the best fit for your pool. For sun protection, you can attach the Shade, which is made of marine-grade Sunbrella fabric and features a media window where you can secure your phone or tablet for hands-free music listening or video streaming while you lounge. You can also opt for the high-back Chair (which sits more upright than the Chaise) and add convenient accessories, such as a Side Table or an Ice Bin Side Table to keep refreshing beverages at hand. Both tables feature an umbrella hole for easy umbrella pairing. New for 2017, Ledge Lounger added a modular Sectional to its line, which allows you to customize your own sofa and ottoman set. 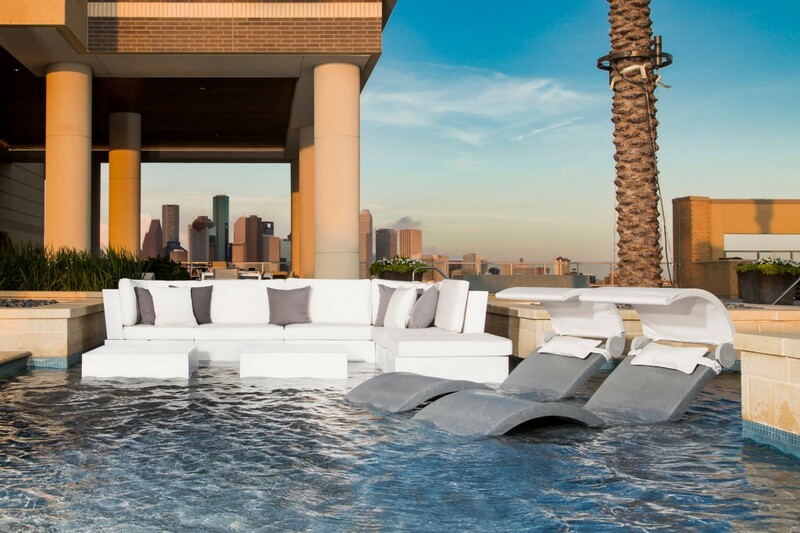 Like Ledge Lounger’s other offerings, the Sectional is made of high-quality outdoor materials, and can be placed in up to 10 inches of water or used on deck for stylish poolside seating. Contemporary Planters—also new for this year—can be added poolside to further enhance your deck or outdoor living area and complete the look. Whether you’re relaxing or entertaining poolside, Ledge Lounger chaise lounges and pool furniture make a convenient and stylish addition to your poolscape. Photos courtesy of Ledge Lounger Inc.